I was on a college road trip when I had my first taste of Mushroom Barley Soup. My friends and I stopped at a roadside deli—I wish I could remember the name of the place. What I do remember is that piping hot bowl of delicious soup. It was love at first bite. You can find this soup on most Jewish deli menus. The dish has roots in the Ashkenazi Jewish communities of Eastern Europe. Mushrooms were popular in these cold-weather countries because they could be harvested, dried, and stored for later use. In my friend Etti Hadar’s family memoir, her Polish uncle Dov Levin talks about how his mother used to string up rows of mushrooms with a thread and needle in the attic. They would hang the mushrooms near the chimney; the heat of the stove would dry them out faster that way. Barley was also plentiful and easy to grow in the Eastern European climate, making it a common addition to hearty winter dishes like soup and cholent. Barley’s history goes back even further; in fact, it is arguably the world’s first and most ancient cultivated grain. It is also one of the Seven Species mentioned in the Bible. Ever since that fateful college road trip, I’ve worked on creating my own soup recipe to achieve what I consider the perfect balance of mushroom barley flavor. I’ve stuck to simple, natural ingredients. Inspired by Uncle Dov’s memoir, I added dried mushrooms with their soaking liquid to the broth, along with fresh mushrooms seared golden brown. The combination adds complex flavor to an otherwise simple soup. 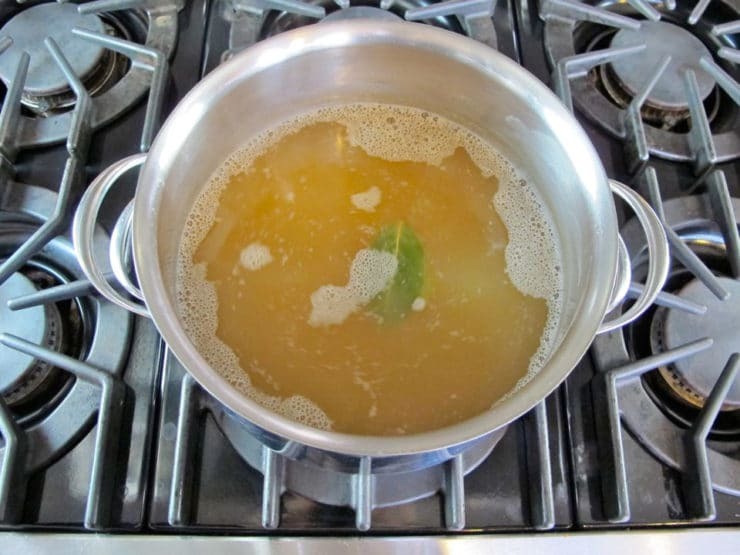 A long, slow simmer reduces the broth, making the soup thick and rich. This robust, filling soup makes a hearty lunch or dinner on a chilly autumn day. Despite being “comfort food,” it is surprisingly healthy. Barley is rich in dietary fiber and selenium. The grain also contains beta glucan, a complex sugar that can help to lower cholesterol. Enjoy! 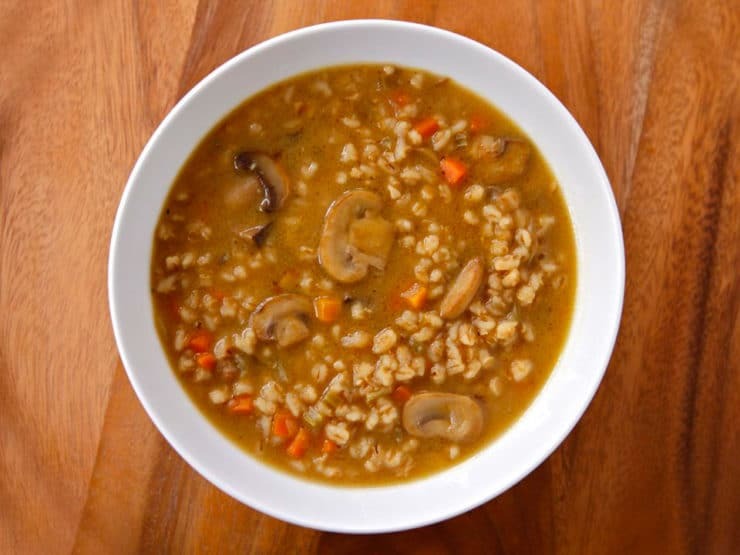 Mushroom Barley Soup - robust and flavorful deli-style soup. Chicken or vegetarian broth. Kosher, Jewish, healthy, comfort food, deli. Pour chicken or mushroom stock into a large stockpot and bring to a boil. Stir in the barley, add the bay leaves, then reduce heat and simmer uncovered. Set your timer for 2:15 (2 hours 15 minutes) starting now. 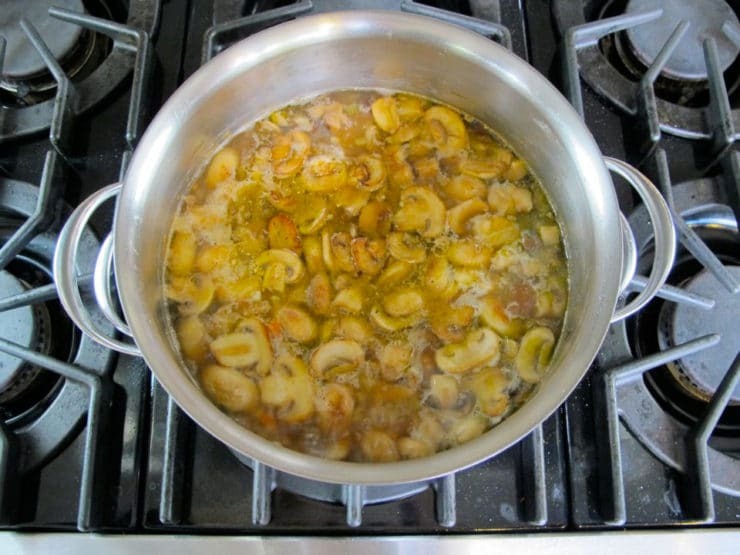 While the soup simmers, place dried mushrooms in a separate small saucepan. Add 3 cups of water to the saucepan and bring to a boil over high heat. 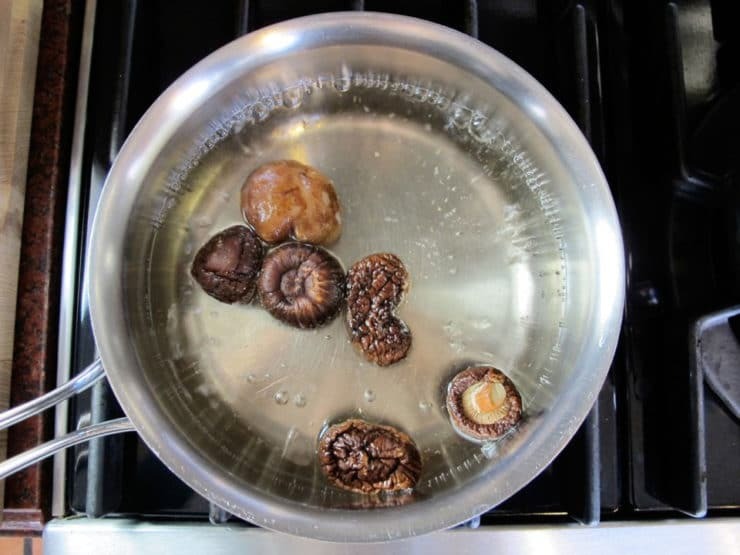 As soon as the water boils, remove saucepan from heat and let the mushrooms soak for 20 minutes. 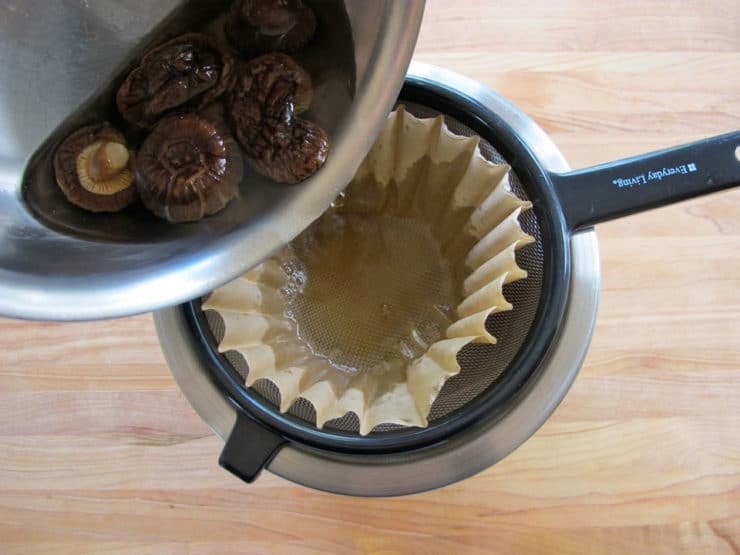 Drain the mushroom water by straining it through a coffee filter (use a mesh strainer or colander to hold the filter). Reserve the mushroom water. 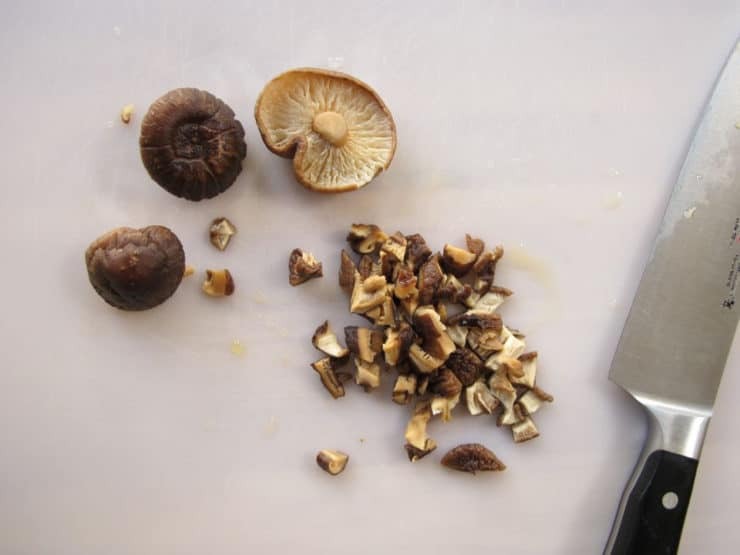 Chop the soaked, softened mushrooms into small pieces and reserve. Heat 2 tbsp olive oil in a large skillet over medium high heat. 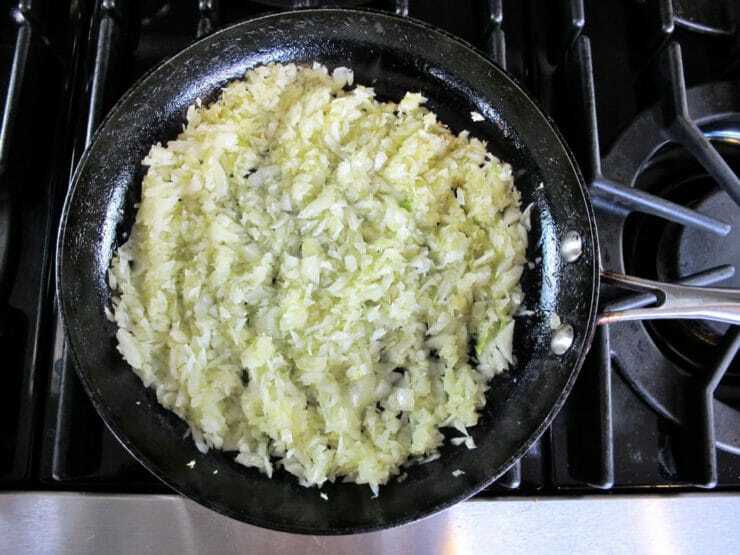 Add the onion to the skillet and sauté till softened. Add the celery and carrots and sauté for 5 more minutes till everything is browning and starting to caramelize. Add the soaked chopped dried mushroom pieces and crushed garlic, sauté for 2 more minutes. Your kitchen should smell really good right about now! 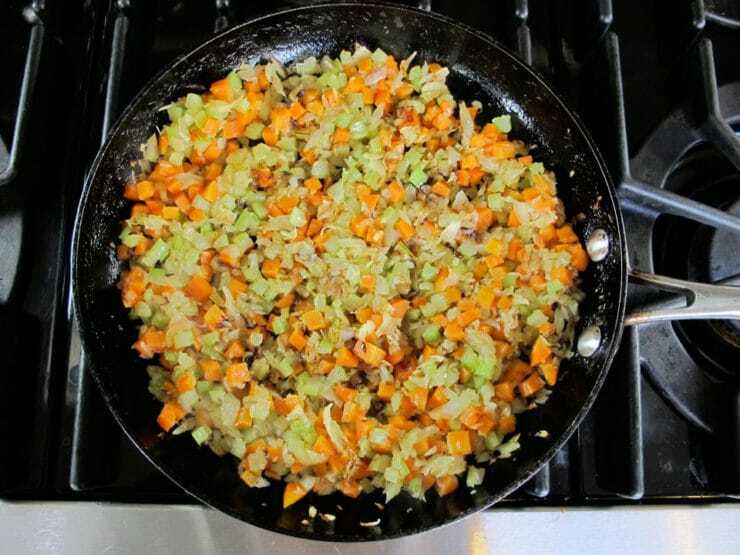 Scrape up any brown bits from the bottom of the skillet. Pour the strained mushroom broth into the skillet, bring to a boil, stir. Cook for 2 more minutes till mixture is hot and bubbly. 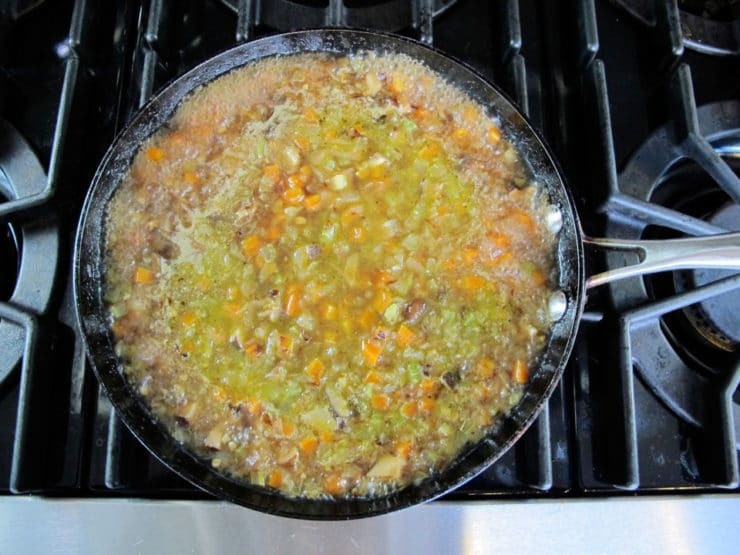 Add the contents of the skillet to the simmering stockpot with the broth and barley. Without rinsing the skillet, heat 1 tbsp of olive oil over medium high heat, tilting to coat the bottom of the pan. 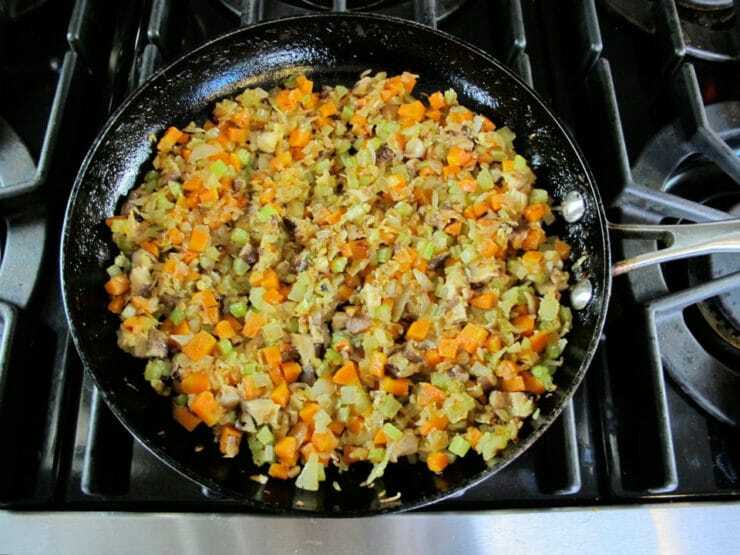 Spread half of the sliced white mushrooms in a single layer at the bottom of the skillet. Sprinkle them with salt and pepper and turn heat to high. Let the mushrooms sear without stirring. After 2 minutes, stir the mushrooms continuously for another 1-2 minutes until they are seared golden brown and shrink to about half their size. Pour the seared mushrooms into the soup pot. 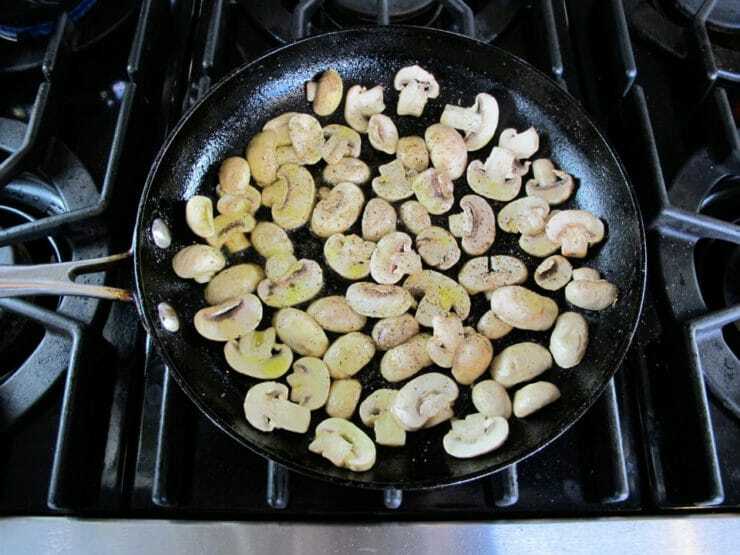 Heat the last 1 tbsp olive oil in the skillet and repeat the process for the remaining mushrooms. Add the rest of the seared mushrooms to the soup pot, stir to blend all ingredients. Reduce heat to a low simmer. Let the soup cook uncovered until your timer goes off (2 hours 15 minutes total cooking time), or until the barley is completely tender and the soup is nicely thickened. Add water during the simmer if the soup becomes overly thick. At the end of cooking, season with salt and pepper to taste. Serve hot. I’d like to roast the mushrooms instead of sautéing them. Do you see any problem with this? everything you want from a mushroom barley soup–thick and rich and velvety smooth with probably a lot less fat than the deli! Thank you, Tori, for the delicious recipe and for the history behind the soup. There is one more thing you can do to intensify the taste. Add a glut of A1 sauce. This sauce was invented to add some nastiness (umami) to meat, and it’s principal ingredient is mushrooms. Give it a try. Outstanding recipe. We try to eat vegetarian as often as possible, so I use organic mushroom broth. The dried mushrooms combined with seared mushrooms in the soup give the recipe an earthy depth and meaty texture. We love it. I just had my second helping, it was lip-smacking good. Thank-you! I didnt have pearl barley, I used the regular and reduced cooking time. I also added a heaping teaspoon of tomato paste. It adds a certain sweetness. I love your idea of pre-cooking the mushrooms to get that lovely carmelized edge. 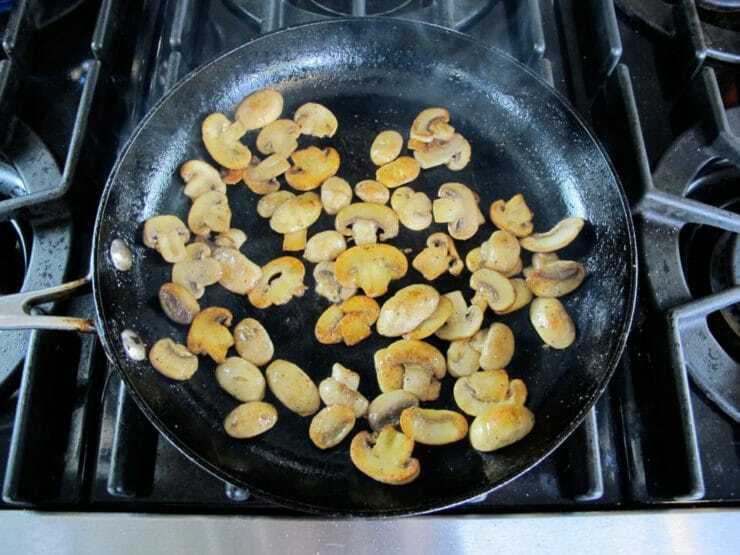 Lately I have been tossing mushrooms in my iron skillet, preheated on high. I toss them in dry. The moisture cooks out of them and they also get that lovely ‘edge’ and concentrated flavor without the work and oil. I did it in two batches then I deglazed the pan, as someone else suggested. Simply divine. Thanks again. BTW, you are my go-to site for vegan recipes. I make soup twice a week, and this season have been searching for new recipes on bloggers sites. I tend to go to the big name chefs and this season have found lots of great new sites such as Tori’s. This recipe is so delicious that I wanted to review it for the public. I made it just as the recipe is written. I froze about half the batch in quart size zip bags to have on a few weeks. Give it a try and you won’t be disappointed. So yummy, definitely hit the mark of the so cal deli taste I was looking for. I used Pacific mushroom broth and the only mushrooms I had were baby criminis! Super easy, wonderfully rich & thick and delicious! My first Tori recipe, I’ll be trying more! Thanks you! This recipe looks lovely and perfect for this time of year, but I’m going to hold out for a couple of weeks so I can make it with fresh chanterelles. They grow like weeds here and they’re just about to start coming up. I found dried shiitake mushrooms but they are probably only an inch in diameter. I understand the sizes can vary and am wondering should I still use six? Or do I need more? Thank you! This soup is phenomenal! Even my husband, who does not usually like soup, couldn’t get over how delicious it is. Thank you! Used a chicken broth that i got in our local vietnamese grocery store, they use it in their Pho, it was outstanding. Couldn’t find pearl barley in our local not so great grocery store, so I used regular barley and reduced the cooking time to 1:30. What a wonderful recipe. Wouldn’t change a thing. I can’t wait to make the mushroom barley soup on Saturday for a Sunday brunch of 8. I’d be more comfortable doubling the recipe to make sure I don’t run short and to allow for leftovers. If I double the recipe do I double all the ingredients? Thanks again for all of your delicious recipies! I have made this soup (more or less) several times , and it reminds me of the mushroom barley soup in a long gone jewish delicatessen. It is delicious and one of the world’s great comfort foods. A couple of comments: first, nothing is exact. You use the ingredients you happen to have. Second: the searing of the mushroom s is a stroke of genious. Third: if you are interested in “why we eat what we eat”, check out Raymond Sokolov’s book of that name. everyone loved the soup. There were no dried mushrooms in my store so i used only fresh mushrooms. My grandchildren thought it was the best soup ever made in the world. Cannot wait to make this tomorrow! An added bonus: a 156 ml can of V-8 or tomato juice adds another interesting element to the soup. Is it possible that the restaurant you had this soup at is Rein’s Deli, Vernon, CT? My family has stopped there dozens of times traveling from NH to NJ, and I order this soup every time. It’s great. It was on the west coast, Dianne, so I’m afraid not. I agree, it is great soup! any deli in Manhattan will have just as good or better then Reins Deli. Reins is good for their rugelah. Everything else was average. Tori, I made this soup several times, and some of your other recipes too. Always wonderful. Reminds me of my mom’s. She taught me how to cook in a very eastern european manner. Great taste but you can’t cook pearled barley for 2.15 hours and still have any texture. Love the shiitake in there! Great tasting soup. I used trimmed chuck instead of short ribs. We also used criminis instead of buttons. I may add more barley in the future just because I like barley a lot. I’m a little confused. I read that you substituted trimmed chuck for short ribs, yet, I don’t see any mention of meat in the recipe. I’m preparing to make it this weekend and want to make sure I’m not missing anything. Marie, I think he made a different version that is posted on the site, but commented on this post. There is also a meat version here: https://toriavey.com/toris-kitchen/mushroom-barley-soup-with-flanken/ Both are great! 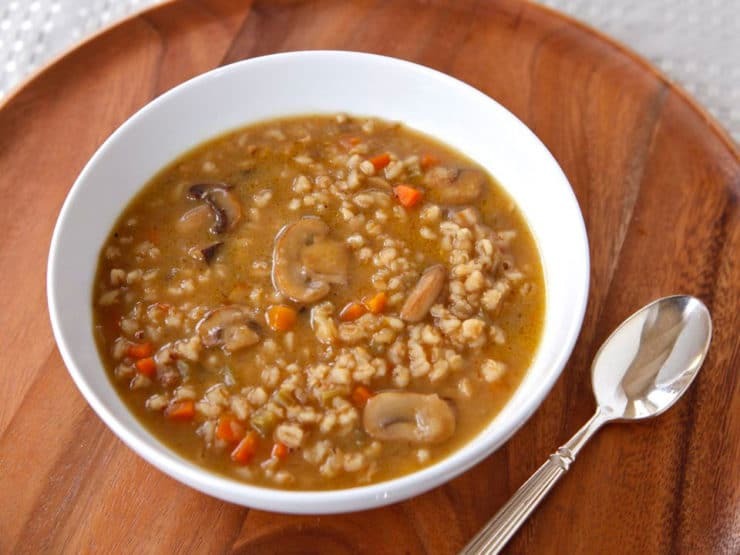 Loved this soup, it’s the best mushroom barley soup I’ve ever made. It IS just like in the deli. I used veggie broth with some parve chicken bouillon for flavor. I couldn’t find any dried mushrooms so I left them out. Used half button and half cremini mushrooms. Delish! This recipe is friggen excellent! My polish babcia (grandma) used to make a barley soup and needed to have some this winter. Thanks Tori! My husband and I are crazy about this recipe, I’m simmering some right now. Since we are mushroom lovers, I tried oyster and crimini in this last batch (our 3rd) otherwise I haven’t changed the recipe a bit. It smells amazing, can’t wait for dinner! You just reminded me about this recipe. It’s finally cold here in Los Angeles, I will have to whip up a batch myself! I made this with a big container of baby bella mushrooms. I added a few shakes of thyme and used no oil and subbed vegetable broth. Finished in my Crock-Pot. Yum. I just made this soup today. It’s very tasty,hearty and healthy! I love i,thanks for sharing!😊 Annemarie Conrod. Just made this soup. DELICIOUS. Did not have the shiitake mushrooms, oh well. Made a mistake and used 1 1/2 cups barley, oh well. Added water. Added fresh thyme, 2 small twigs. Sautéing the mushrooms is the trick. Gives the soup a richer taste. It’s rare that I take the time to leave a review for a recipe. But this is outstanding. Thank you so much for sharing this recipe. I’m sitting here eating it now and it’s exactly what I was hoping for. I used Pacific Mushroom broth and fresh shiitakes instead i am pressed for time! I will let you know turnout . Letting barley cook . I was craving a delicious bowl of good Mushroom Barley Soup. I’m not sure what everyone else did differently to enjoy it, but this recipe turned out very bland. Even adding kosher salt didn’t help. A lot of expense and effort for a disappointing soup. Hoping the flavors might meld over night. Thanks anyway. Could I use vegetable broth instead? Hi Abby, Tori’s assistant Ashley here. Yes, vegetable broth would be fine. Can I freeze this in a vacuumed sealed bag of will the barley absorb all the broth. It should be fine in a sealed bag, Diane. If you need to you can add some water to reconstitute as you reheat it. Made it today and served for dinner to two old Chicago Jews and two New York Jews and it was absolutely the best ever outside of a Jewish deli or Ratner’s in NYC. I will definitely make this again and again, and I buy dried shiitake mushrooms online. The soup is simmering now and smells out of this world! The only small addition I made is deglazing the pan after searing the mushrooms with about 1/2 cup of stock. I couldn’t leave all those beautiful brown bits and coating without adding it to the soup. I like this idea. Deglazing with sherry or white wine would probably be good, too. My husband is crazy about any and all foods with mushrooms, and this recipe is a new favorite. He had two full bowls as soon as I was done cooking it! I omitted the celery and added more carrots in its place. My husband truly dislikes celery. I was afraid it would change the flavor profile and the soup would not be as good, but we both loved it as we do all of your recipes, Tori! I can’t find dried shitake mushrooms at our local stores. Can I use fresh shiitakes instead? Hi Julie, Tori’s assistant Ashley here. I would not recommend using fresh mushrooms in this recipe. The dried mushrooms lend a richer flavor to the broth for this soup. I couldn’t either and made it without, still tasted great! I did not add the dried mushrooms either but I did add a packet of mushroom gravy instead! 😉 I figured it would give me the flavor I might be missing! Haha! Tasted great! I was very disappointed and thought it had no taste. Had one bowl and thre the rest out. Sorry to hear that Vera! A lot of my readers swear by the recipe, but I suppose it can’t be to everybody’s taste. Better luck next time! You could have added spices. All that effort and you threw it out. Wow. Has anyone tried freezing this soup? Looks great! I’ve frozen this recipe many times before, it thawed out nicely and tasted just as good as freshly cooked. I always used to love beef barley soup when I was a kid, but I’ve since gone vegetarian. So I made a vegan version of this using vegan “beef” flavored soup base, and I’m very pleased with the results! There are 3 great soups in this world (at least, the vegetarian world, to which I belong). These are Potage Parmentier (Potato and Leek Soup), Potage au Pistou (Provencal vegetable soup with two pestos, one tomato and one basil) and Tori’s Mushroom Barley Soup. The first two are by Julia Child, the third is by an equally gifted master of the art. Thank you! This is, without a doubt, the best mushroom barley soup I’ve ever had! And I made it!!! I’m a so so cook and I followed your directions to the t. It was so good that I ate every spoonful (except for the bit I mixed in with my dogs food…she has a very sofisticated palette and wouldn’t leave my side until I shared some with her). I am right now making my second batch so this time I will share it with friends so they know what an awesome soup maker I am. Thanks for sharing this delicious recipe! I think your dog and my dog were separated at birth! Haha glad you’re enjoying the recipe! Recipe turned out great. Delicious! I made this with only 1tbs of olive oil and it was delicious! No need to add all those extra calories. I made this soup for dinner last night. The only change I made was that I halved the recipe because we are only two. Oh my gosh, I have to say that it was spectacular. We both went back for seconds and my partner took the rest of it for lunch today. This is a keeper and I will make it again and again. Thank you Tori for some lovely ideas and delicious food.